Keeping yourself and your family healthy is an important goal, but not always an easy one to achieve. 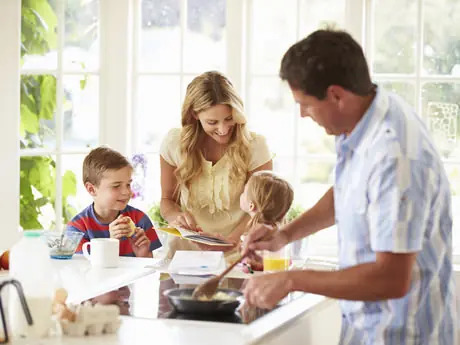 Here are a few tips, suggestions and observations to help you in your pursuit of a healthy and happy family. You like art? Try hanging images of fruits and vegetables in your kitchen. Perhaps change them often. Experts say that exposure is key to getting someone to recognize a brand and encourage usage. The same goes for healthy living. A recent study appearing in the prestigious Journal of the American Medical Association showed that putting photographs of carrots and green beans on kids' school lunch trays increased the quantities of vegetables they ate at lunch. Research has shown that your personal environment has a lot to do with how you make choices. For instance, if you have lots of fruits and vegetables visible and ready to eat, if you know how to cook them and make sure they're very tasty, you and your family will be more likely to choose them over other, less healthy foods. Make sure to have a bowl of fruit and a bowl of vegetables that don't need refrigeration out on the kitchen counter or as the centerpiece on your dining table. Also, if you have fruits and veggies in the fridge, don't put them in a drawer where you can easily ignore them. Make sure they're front and center so that you see them every time you open your fridge. More: How Much Do Your Kids Need to Eat? Always offer your kids the vegetables first, when they're hungriest. One study has shown that children who were given vegetables to eat before any other food ate more of them than children who were provided all food options at once. It's hard to get anyone to think about healthy foods first, but teens are particularly notorious for rejecting sound advice. So, researchers at the University of California at San Diego and the University of Texas at Austin have taken a novel approach and are linking healthy choices to things teens do care about. The researchers are presenting the intervention as an expos? of the deceptive practices food companies use in order to manipulate teens to eat junk food—such as by engineering the food to be as addictive as possible and by using dishonest labeling to make products appear healthier than they are. What they found is that, "by changing the way teens think about healthy eating, we're able to increase the extent to which teens want to see themselves as healthy eaters ... and by doing that, we're able to increase the rate at which teens make healthy choices.